Ethyl alcohol (ethanol) is the type of alcohol used in beverages and is produced by the fermentation process of a variety of grains, fruits & vegetables. Alcohol is a Central Nervous System Depressant which means that it slows down all of the vital functioning of the body, including: breathing, heart rate, blood pressure, a persons ability to perceive what it happening around them, slurred speech, unsteady movement and an inability to react quickly to risky situations. Most people drink alcohol for its stimulant effects and don't realize that the after effects are not stimulating. note: just because some one binge drinks, does NOT mean they are an alcoholic or have a dependency disorder. 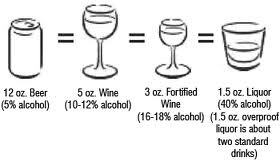 Any standard drink in the United States is considered to contain 0.6 ounces of pure alcohol. 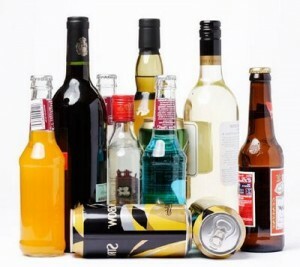 These can all be considered to have the same amount of alcohol and are each one standard drink!